Last week I shared a post with you from the blog “With Mel“. Lucky Mel lives and knits in Hawaii. She is coordinating a knit washcloth drive to send to Haiti (isn’t the internet fabulous). I was able to knit 4 washcloths this weekend and send them on their way in time to meet the shipping deadline later this week. There’s more on her blog. 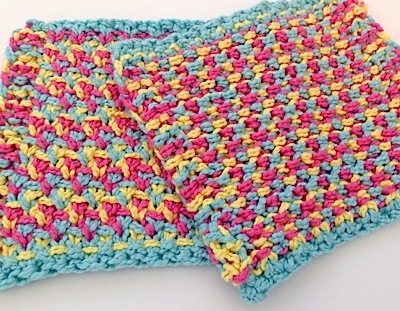 I chose to use a 3-color half linen stitch – pretty and practical for this purpose. I knit with 2 strands of Cascade Luna, a nubby cotton that created a nice dense fabric that looks good on both sides. I can picture this swatch as a sturdy summer tote or backpack for a little girl. I found Mel’s blog on Bloglovin’ and immediately liked the quality of her photos and designs. 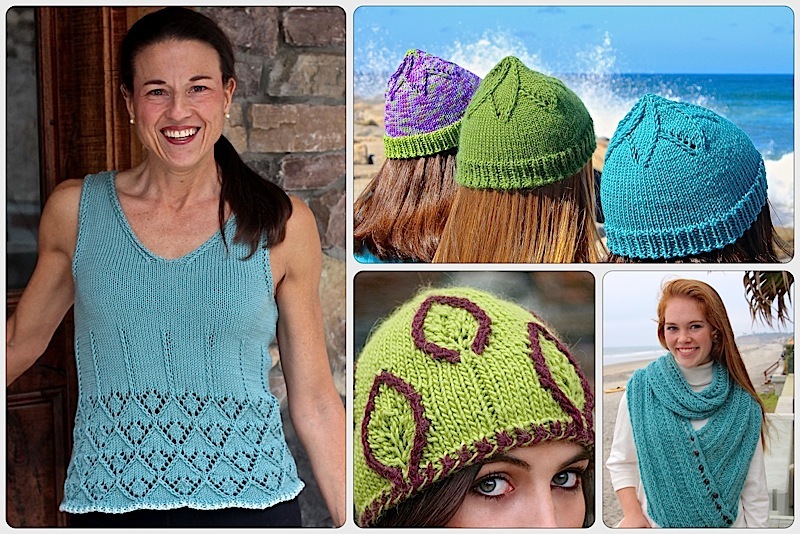 Like many, most, all of you, I like to follow a lot of knitting blogs. I’ve been fumbling around looking for a new reader since Google abandoned the space. I am really late to the game with Bloglovin’. I like the way the posts in my blog search are presented in a Pinterest style format so I can get a good feel for the blog right away. New post summaries with photos come right to my email. It’s easy to create groups so you can read what you’re in the mood for. 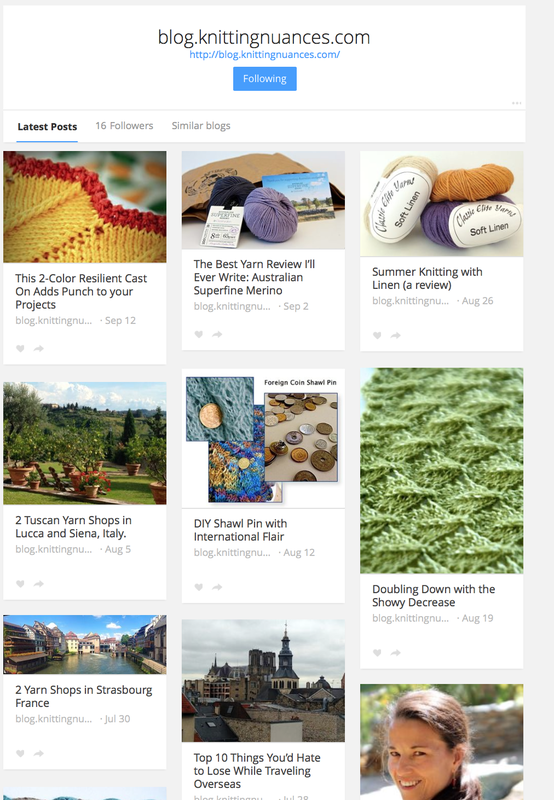 I have knitting (of course), fashion, food and travel. There’s a Bloglovin’ app so I can catch up on my reading while on the go and since I am never not on the go it comes in pretty handy. Not only did I find a few new knitting blogs but I am really enjoying Hand Luggage Only and can’t wait to pack up my yarn to take along on some of those journeys (this time I won’t lose anything important!). If you guys have other favorite readers I’d love to hear about them. Here’s how we look on Bloglovin’. It was really easy to add a new blog to the site so now we are listed there. You can find them, not surprisingly, at bloglovin.com. Now I’m off to read your blogs. Frances you are in luck. 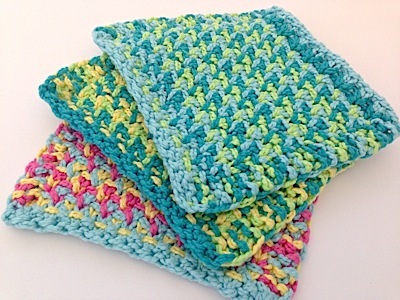 The Knit Picks blog has “52 Weeks of Free Dishcloths” that I think would work for bodies too! Here is the link: http://tinyurl.com/pf5dblw. I haven’t looked to see if they have a Half Linen one but I recommend that stitch because it is so dense. This entry was posted on October 7, 2014 by Laura Cunitz in General, Yarn & Yarn Shops and tagged Cascade Luna, Haiti Charity, Knitting Blogs.